Which was the first International Test cricket match? The first credited Test match was played in March 1877 between Australia and England at Melbourne,Australia. In which year was the first Test cricket match played? 1877 between Australia and England. at the Melbourne Cricket Ground (MCG), where Australia won by 45 runs. Which is the first ever catch by a wicket-keeper in Test cricket? Jack Blackham (John McCarthy Blackham ) of Australia took the first ever catch by a wicket-keeper in Test cricket. The match was played against England in March 1877.
Who bowled the first ball in test cricket? Alfred Shaw of England bowled the first Test delivery to Charles Bannerman of Australia in March 1877 Test match at Melnourne. Which is the first ever stumping by a wicket-keeper in Test cricket? 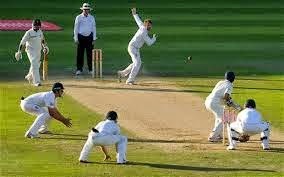 Jack Blackham (John McCarthy Blackham ) of Australia did the first stumpin in the test match played against England in March 1877.
Who scored the first test cricket match run? Charles Bannerman of Australia scored the first run in the history of test cricket from the delivery of Alfred Shaw of England in March 1877 at MCG ( Melbourne). Who scored the first Test century? Charles Bannerman of Australia Scored the first Test century in the history of Test cricket. He scored 165 runs aganist England in March 1877 at Melbourne. Who took the first test cricket wicket? Allen Hill of England took the first Test wicket and the first catch. Hill took the first-ever Test wicket when he bowled Thomson of Australia in 1877 March during Englands tour of Australia. Who took the first catch in the history test cricket? Allen Hill of England took the first catch in test cricket history against Australia in March 1877 at Melbourne. Which player was the first to be run-out in international test cricket history? Australia's Dave Gregory was the first player to be run-out. This was during the test match against England in March 1877 at melbourne. Which bowler took the first 5 wicket haul in history of Test cricket? Billy Midwinter of England picked up the first 5 wicket haul in the test match against Australia in March 1877 at Melnourne. Who was the first Duck ( player who was out with out scoring any runs) in Test cricket? The first duck in a Test match was made in the very first Test of all, between Australia and England at Melbourne in March 1877, when Ned Gregory was caught by Andrew Greenwood off the bowling of James Lillywhite. Which was the first tied international test cricket match? The first tied Test was played between the West Indies and Australia during 9 - 14 December 1960. The match was played at the Brisbane Cricket Ground, in Brisbane, Queensland, Australia. Which is the first drawn cricket test match? Click here to know what is first in the history of One Day International Cricket.